The Stilton Cheese Classic Car Run is organised by Jim Barry in conjunction with Uppingham First and takes place in late April each year meeting at The Falcon Hotel. The Uppingham Christmas Fatstock Show is staged every year in the last week of November and has its own organising committee drawn from the local farming community. If you want to organise an event in the town on one of the Town Council's open spaces or in the Market Place - first of all contact the Town Clerk so that the event procedure can be made available to you and any related costs be made known. You can either email townclerk@uppinghamtowncouncil.co.uk or phone on 01572 822681. Uppingham Town Council owns three open spaces, these are Tod's Piece, Beast Hill and Hog Hill. The most significant in terms of size is Tod's Piece which is located a short distance from the town centre. Tod's Piece is home to Uppingham Town Football Club, Uppingham Bowls Club and 1st Uppingham Scouts. Additionally Tod's Piece has play equipment for a range of ages, a football pitch and skate park. Next to the skate park is a small landscaped garden in the shape of Rutland County. Along the Gainsborough Road boundary are trees donated by Uppingham School for the Millenium Project. This park is subject to local bye-laws which are displayed on site. Beast Hill and Hog Hill are located off South View close to the Town centre. Both these locations feature in the Uppingham Heritage Trail and as the location suggests enjoy views to the south of Uppingham. 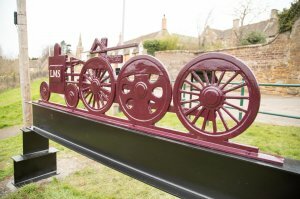 Hog Hill has an art installation recently located on site with a locomotive theme overlooking Station Road. After a long build process the Skate Park on Tod's Piece finally opened in April 2016. The concrete structure has been eagerly anticipated and so far has proved a real attraction for all sorts of activities. 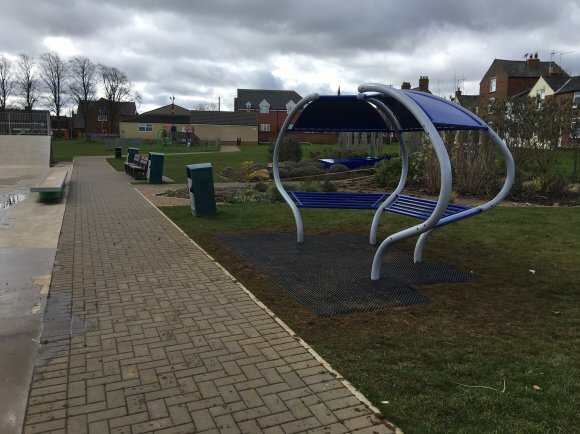 The funding for this installation came via Town Council specified reserves and a significant grant from WREN. The project by completion cost just under £85,000 and was a much needed update to the previous wooden structure. For youngsters using the skate park we'd ask you comply with the safety guidance, wear the appropriate safety equipment and leave the park free of litter by using the bins nearby. The Lions Club of Rutland donated in January 2018 £5,000 for the installation of a meeting point seat next to the skate park. The total cost was just over £6,000 with the balance being provided by the Town Council. The seat commemorates 100 years for the Lions Club of Rutland.